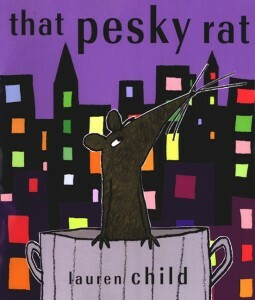 That Pesky Rat by British children’s author/illustrator Lauren Child is a wonderful story about a brown rat who doesn’t quite fit in with his life circumstances. As he introduces himself and takes us on a tour of his world, including his friends’ diverse homes and lifestyles, it becomes clear that the rat would like to both be and have a companion. He posts a notice to that effect at the local pet store despite no small degree of skepticism on the part of the shop owner and the rat himself (his posting seeking a home is perhaps one of the best portions of any book that I’ve read in some time). Lo and behold, in a humorous twist, his posting receives interest and the story ends with our affable hero happily ensconced in a new home. This story provides us with the voice of a modern-day rat — a creature so often maligned — and gives us the opportunity to stretch our empathy muscles. The fantastic mixed media illustrations are a wonderful complement to this witty, humorous story. Note that companion animals are referred to as pets, there is the aforementioned pet store, and one of the rat’s friends is a circus performer. Nonetheless, this book is a treat for kids aged 4 years and up, as well as the adults sharing the story.